The Jenolan Caves are in the Blue mountains about 175 kilometers west of Sydney, and easily seen in a day tour which includes some of the Blue Mountains Highlights. 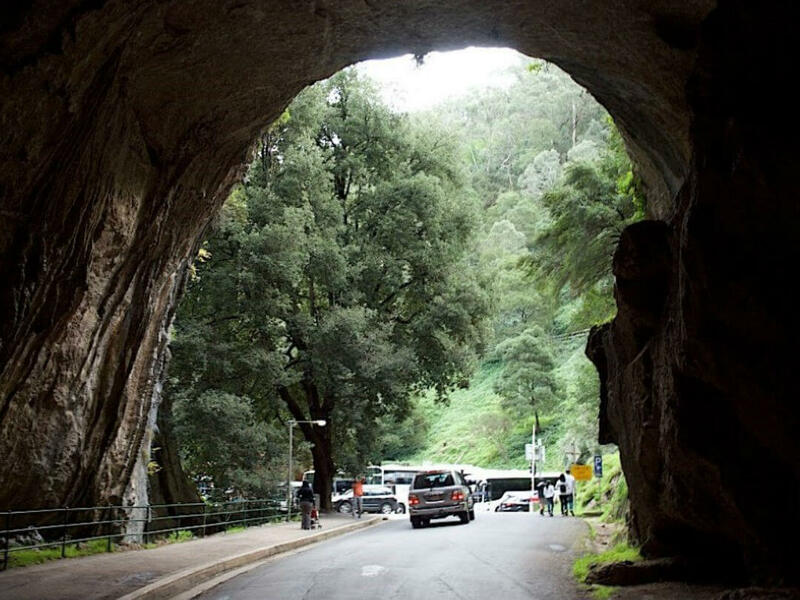 There is no public transport from Sydney to Jenolan Caves so the best way to see them is part of a guided day tour from Sydney. 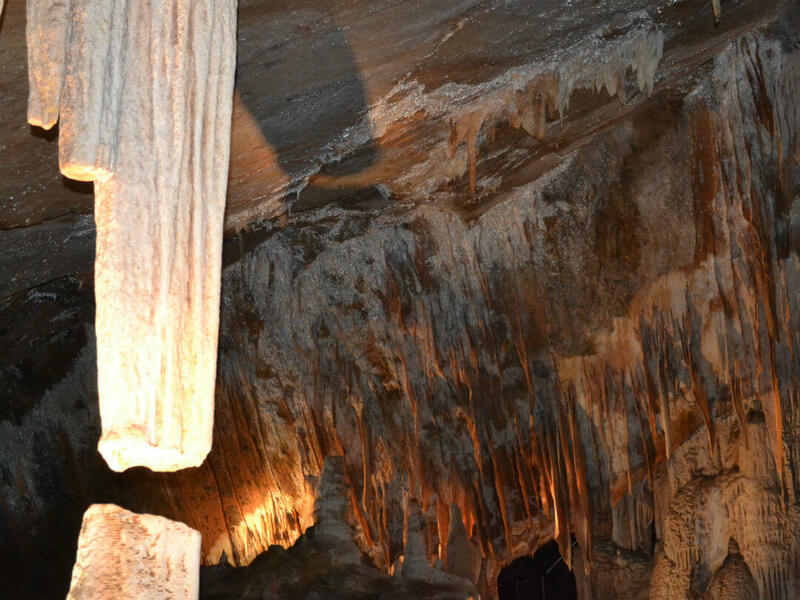 Most of the caves within the Jenolan Caves network must be experienced as part of a guided tour, although there are a limited number of self-guided caves available. Jenolan Caves is the world’s oldest open cave system. Discovered thousands of years ago by the traditional people of the region and then by Europeans around 1838. Local pastoralists James and Charles Whalan are credited with first discovering the caves although it may have been James McKeown, an ex-convict and possible Bushranger who was reported to have used the caves as a hide out. In 1866 the government took control of the caves and in 1867 Jeremiah Wilson was appointed keeper of the caves. Wilson was responsible for discovering a number of the caves and continued to explore and discover caves for the next 30 years. The name Jenolan, meaning high mountain or high place was adopted for the area in 1884. 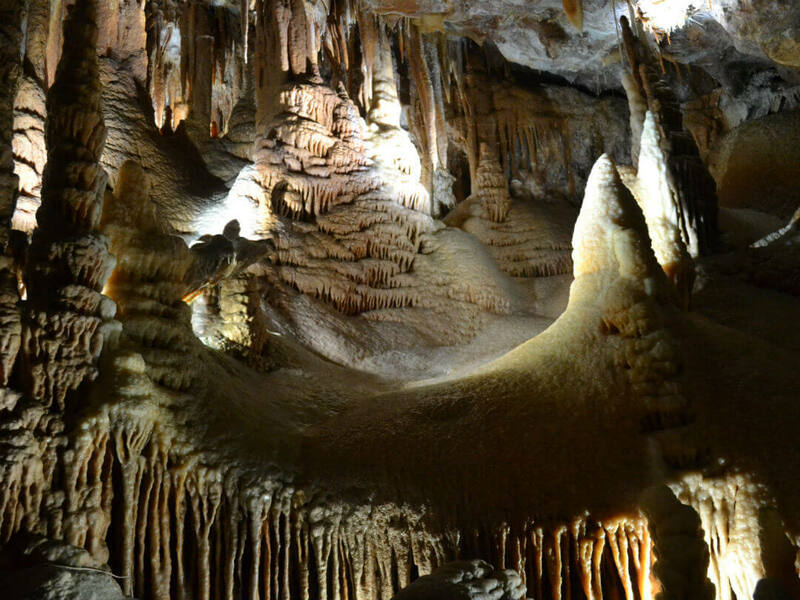 There are a total of 9 show caves in the Jenolan Caves network. 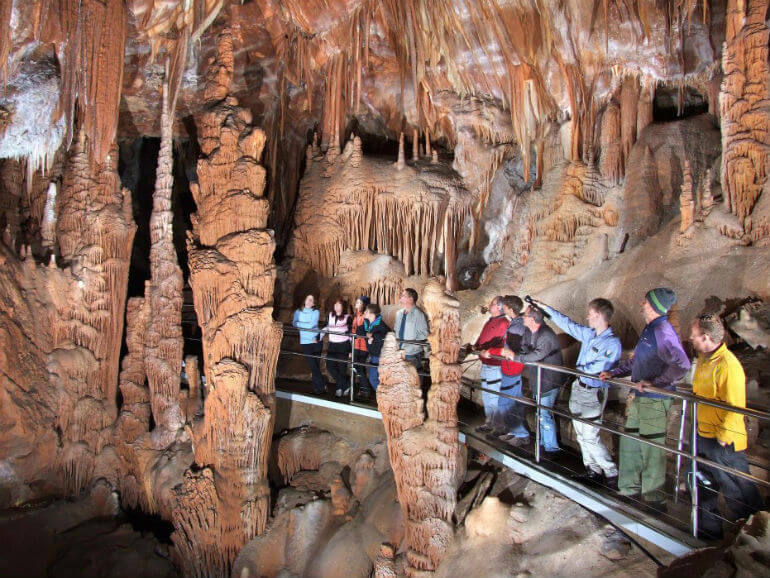 The Lucas Cave is the most popular cave with travel groups and is an excellent cave to visit on you first trip to Jenonolan Caves. It is also the cave of choice on the tours featured on the Tours to Go website. At times when the Lucas Cave is unavailable the Imperial of Chifley cave are used. In addition to these cave there is a self guided cave the Nettle cave and for the more active an ‘Adventure Caving’ option is available which includes an abseil into one of the caves. The adventure option is available as part of this tour. 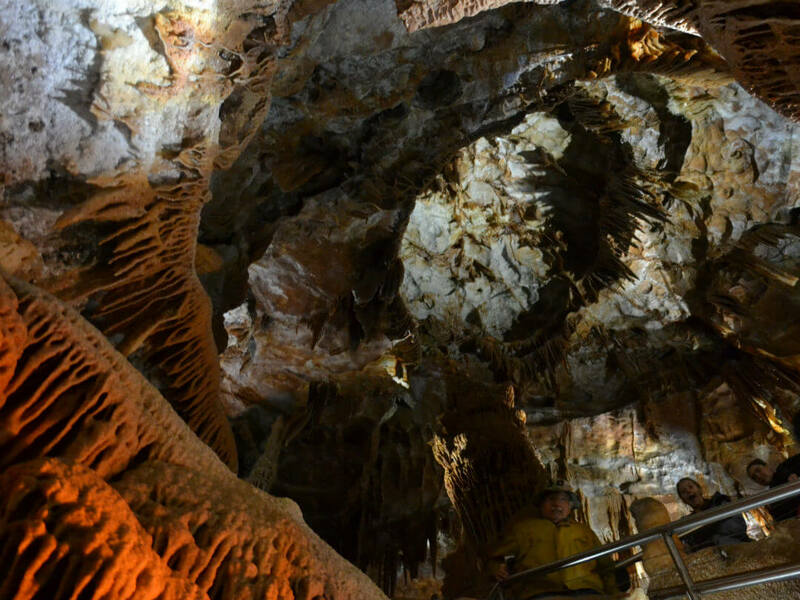 Showcasing some of the Jenolan Caves most popular features, The Lucas Cave, is the most common cave visited and if you are a first time visitor to the caves, is an excellent introduction to the Jenolan caves systems. Although rated as one of the more strenuous caves, with over 900 steps, the guides make regular stops to show you the features of the caves so it is suitable for most fitness levels. The first Europeans to discover the Lucas caves were Nicholas Irwin and George Whiting in 1860, and the name honours John Lucas, a politician who was instrumental in having the caves protected as a reserve in 1866. At just over 54M the Cathedral is the tallest chamber at Jenolan Caves, and is used to host weddings and concerts. it is for this reason that at times the Lucas cave is unavailable and alternate caves are used on some guided tours. Normally the guides will play some music while in the Cathedral to show you the amazing acoustics of the Chamber. 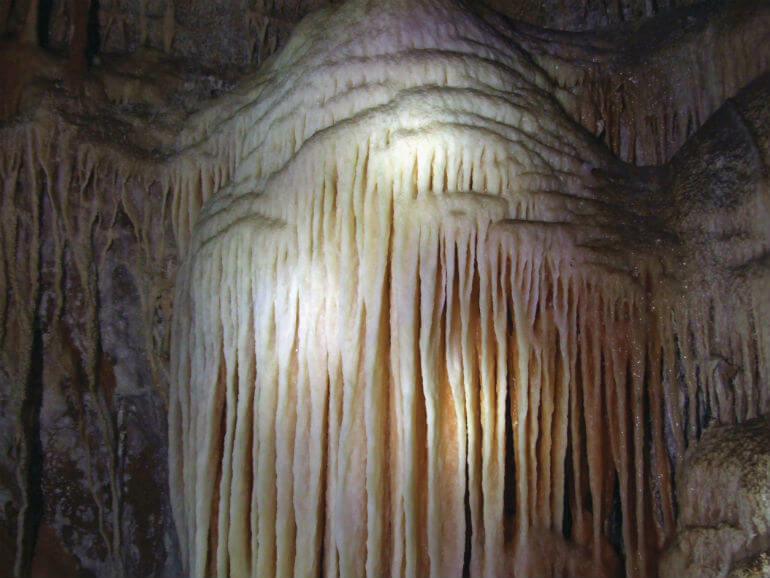 The Broken Column is one of the most photographed features of the Lucas Cave. Sometime in the distant past the rock underneath the column subsided and split the column, amazingly the two section remain in near alignment. For many people the highlight of the tour is the Underground River, which looks like a pool but is part of the river that formed the cave. Other features include the Mafeking Chamber, one of the most picturesque parts of the cave, the Terraces and the Bone Cave. This is the most accessible cave and also, since it is lacking any massive chambers, you can see many of the features close up and allows for excellent photographs. 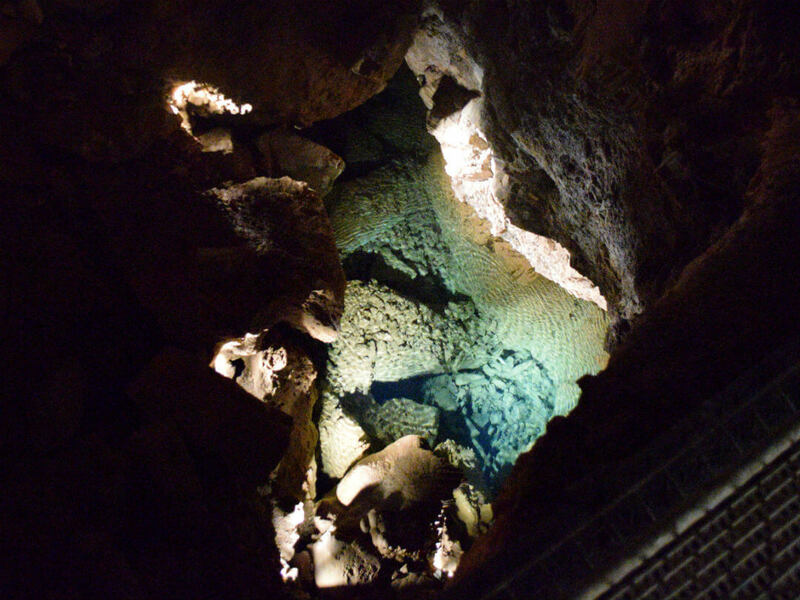 The cave was discover in 1879 by descending through the Sinkhole from the Elder Cave. Near the Sinkhole you can view the skeleton of a Tasmanian devils which was discovered in a nearby cave, the skeleton dates back to a period when the animals populated mainland Australia as well as Tasmania. Shawl Cave features many shawl formations and leads to a large stalagmite called Lot’s Wife and if you are lucky you may see some of the, insect like, Springtails that inhabit this cave. You will also see Ridley’s Shortcut which is definitely not a shortcut you want to take as it immortalises Ridley’s fall through the sinkhole from the Elder Cave above. Near the entrance to this cave you can make the descent to the Underground River, this is a different river as seen on the Lucas Cave tour. Named, in 1952, to honour the Local Member and Australian Prime Minister Ben Chifley, the cave was the first cave in the world to be lit with electric light. 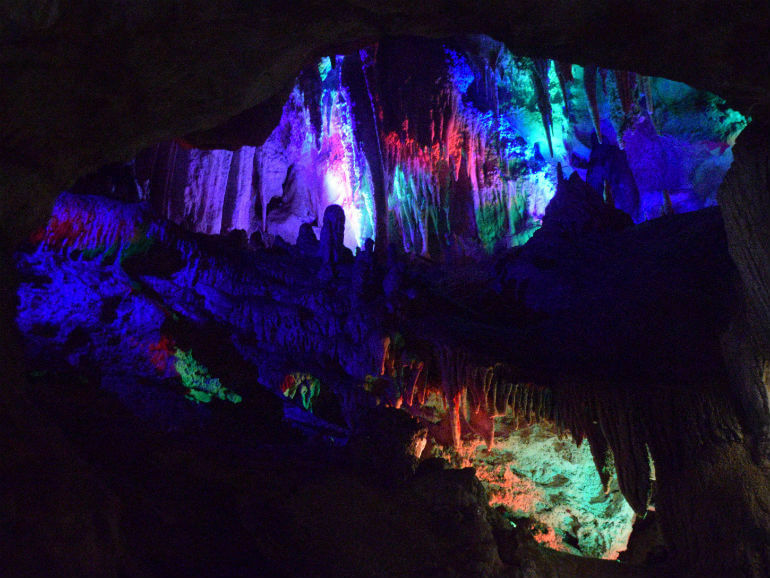 On some parts of the tour the historic coloured lights remain making this cave popular with children. The person responsible for installing the electric lighting in 1880 named the Margarita Chamber after his wife. In keeping with that theme there is also the Lucinda Cave named after the wife of Jeremiah Wilson who discover this cave and many of the others. Tour time around 60 minutes. Although rated as a medium difficulty tour it is self guided so you can adjust the pace of the tour to suit your own fitness level. This tour includes the Grand Arch and is one of the few tours that does. The Grand arch was the first cave that Europeans discovered along with the Devil’s Coach House, the largest formation at Jenolan Caves. At the entrance to the Grand Arch is Camp Creek responsible for the formation of this cave. An interesting feature in this cave is the Tombstones, named for their familiar shape, they occur due to an interaction of the surface algae and the light that enters the cave at this point. The large open space is the Ballroom and from here you can see the Sculptor’s Studio, the Devil’s Coach House and through to McKeown’s Valley. 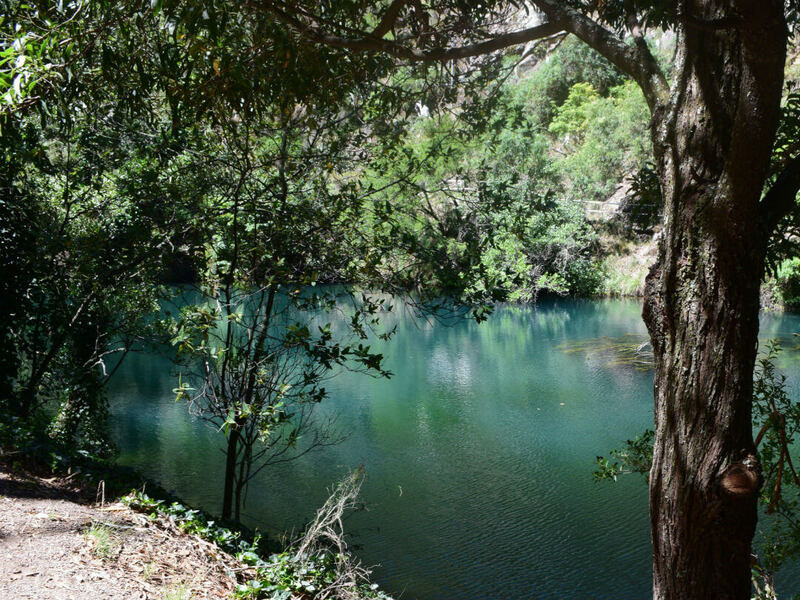 The name McKeown is associated with the ex-convict and possible bushranger James McKeown who was thought to have used the caves as a hide out. This self guided tour is included as part of any admission ticket. If travelling on a guided tour there may not be the time to complete this tour. Tour time around 45 minutes. Your natural body oils damage and discolour the caves so please don’t touch any of the cave formations or walls. Only bottled water is allowed in the caves. Cameras are permitted but tripods and selfie sticks are not. The temperature within the caves remains 15°C all year round. 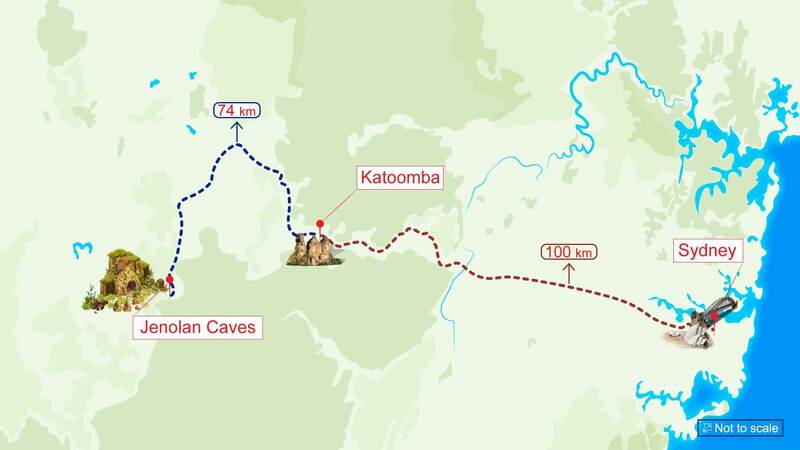 There is no public transport to Jenolan Caves, self drive or guided tour are the only way to get to Jenolan caves. For one day a year the 45klm walking trail becomes a marathon course. Starting at Explorer’s tree and ending at Jenolan Caves. This is one day of the year the track is closed to the public. 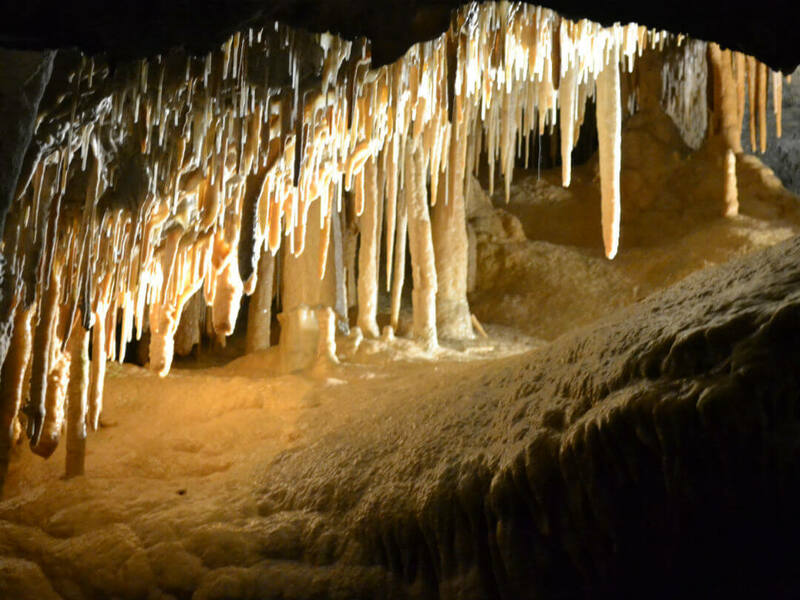 Recently Andrew and his family went to the Blue Mountains and Jenolan Caves with AAT Kings on this tour. For an insight into this fabulous day read his tour review here.